If you're concerned about your body fat levels, you have a few options that could help you figure out where on the scale from "healthy" to "obese" you are. Body mass index, or BMI, gives you a very rough estimate of whether you're at a healthy weight or not. A handheld bioelectrical impedance analysis machine, which uses small electrical signals to estimate your fat levels, can help you estimate your body fat levels. For more precise measurements, though, you're better off consulting a professional. Body mass index is calculated using just your weight and height, so it is just an estimate of whether you're likely to fit within the healthy weight range. Any weight between 18.5 and 24.9 pounds puts you within the normal range, while anything higher than this indicates you may be overweight. For example, if you're 5 feet, 7 inches tall, you're considered a healthy weight if you're between 121 and 153 pounds. This measurement doesn't take into account how much muscle a person has, however, and it can overestimate fat in very muscular people or underestimate in elderly individuals. The handheld machines sometimes used to measure body fat rely on bioelectrical impedance, which estimates your body fat using a painless electrical signal that's sent through your body. Because it takes different amounts of time for the signal to pass through fat, muscle, bone and water, the time it takes it to move from one side of your body to the other can be used to estimate body fat. The electrical signal easily passes through water, goes a bit more slowly through muscle and bone and slows down even further when it goes through fat. Thus, the more muscle and the less fat you have, the faster the signal reaches the other side of your body. The equations used for this take into account your gender, weight, height and activity level, as these factors can all affect body composition. You can purchase scales that use this type of technology, as well as handheld devices that measure from hand to leg, finger to finger, hand to hand or leg to leg. The healthy range for body fat for women is between 19 and 32 percent; for men, it's from 16 to 25 percent. A number of factors can affect the accuracy of the handheld BIA devices available to consumers, and some device measurements are more accurate than others. Those that measure from leg to leg are more accurate than those that go from hand to hand or finger to finger, according to a study published in the International Journal of Exercise Science in 2011. Although they aren't as easy to find, the ones that measure from leg to arm are even more accurate, notes physician nutrition specialist Dr. Melina Jampolis in an article published on the CNN website in 2011. This is because this type of device also measures belly fat, while hand-to-hand and leg-to-leg ones don't. Take your measurements at the same time each day, and don't do it right after drinking or eating, first thing in the morning, or soon after finishing a workout. Your hydration levels can affect your body fat reading, so if you're dehydrated one day and overhydrated the next, you'll see inconsistent results. Changes in skin temperature can also affect the results, as can menstruation and certain medical conditions. Handheld BIA machines aren't necessarily the most accurate way to measure your body fat levels. Another inexpensive and portable way to do this is to use a tool called a skinfold caliper to pinch between three and seven different places on your body to measure how much fat is under the skin. These measurements are plugged into an equation to get a good idea of how much fat you have overall. 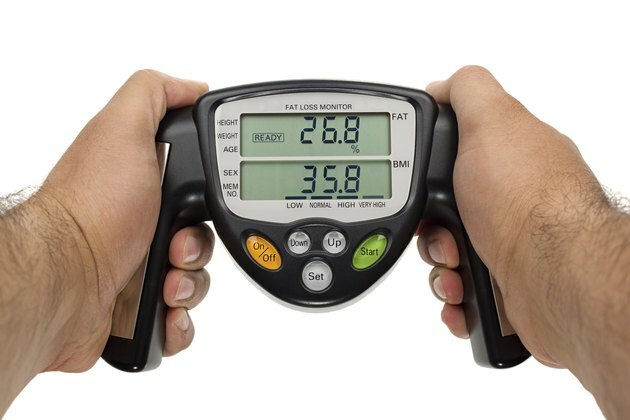 Skinfold calipers were found to be more accurate than handheld BIA machines for measuring body fat in the International Journal of Exercise Science study. This is only true if the person using the calipers has been properly trained, as it is easy to get an inaccurate pinch that would cause an overestimation of body fat. This type of testing isn't as accurate in people who are very obese, and it can't be used to measure the more dangerous deep belly fat, which isn't just under the skin, however. Underwater weighing, MRI and CT scan are all very accurate ways to measure body fat. Some clinics also use other specialized equipment, such as X-ray-type body scans, to measure body fat levels. These types of test, which are very expensive, are not widely available to people without a doctor's prescription, however. Nutrition Journal: Is Bioelectrical Impedance Accurate For Use In Large Epidemiological Studies?